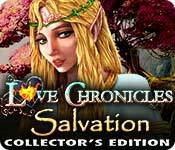 Love Chronicles: Salvation Collector's Edition is rated 3.9 out of 5 by 50. Rated 5 out of 5 by Sheerija from REVIEW OF COMPLETED GAME I am somewhat nonplussed at all the negativity aimed at this game. I wondered if I was playing the same one. It is from the purring ginger kitten people and they have completely outdone themselves. I found it delightful and charming, beautifully designed and with gorgeous colours. I kept thinking surely there cannot be any more locations, secret passages, hidden doors and again and again I was wrong. It is like a maze and it is a-maz-ing. It is fortunate they included an in-game window via the hint button that when clicked takes you straight there. I believe I saw a map but never needed it. Likewise the SG. That wonderful feature was all that was necessary. Smooth and fast navigation. Fast skip button and the hint button takes no time at all to recharge. The iHOPAs are varied and not too many and the puzzles are bright and fun. The music is lovely, like a choir of angels. I love the story which, while nothing I haven't seen before, was very well told. There are cute and creative creatures to interact with and a host of interesting characters. I just glided through it effortlessly with such a high level of enjoyment and appreciation, it is now my favourite game. All other devs have taken a step down and these guys are at the top of my list. The main game took me 5 hrs and the BC 1.15 hrs. The main game ends very well but the BC is wonderful and well worth playing. I would not have thought it possible, but the graphics in it are even better than the main game. Huge entertainment factor there. Loved it. There are no achievements or collectibles but the level of quality, design and content are such that I can easily say this is definitely deserving of it's CE status. Well done to these devs, who obviously invested a huge amount of time and effort into making this one of the best games I have ever played. Would not have missed it for the world. I just wish I could have kept on playing and playing. Rated 5 out of 5 by KristyKritter57 from Brilliantly Colored HOG This game was not rated when I downloaded the demo, so I based my opinion of the game on the beautiful stunning colors with scenes both solid & swirling about. Both mini-games & HOG's were easy on the eyes and challenging to a certain degree. Since Nilosh had not yet rated this game and I take notice whenever he does, since we have the same gaming tastes in Hidden Object Games & Adventures, for every game that he has rated in the past, I have pretty much agreed straight on with his ratings, but not for this one, it was worth a 5 star. For me, visual is about as important as content. I personally care less about the extras that come with a CE game, but when I like something from the get-go I find myself unwillingly to wait for the SE to come out. And this was a must buy for me from the get-go. 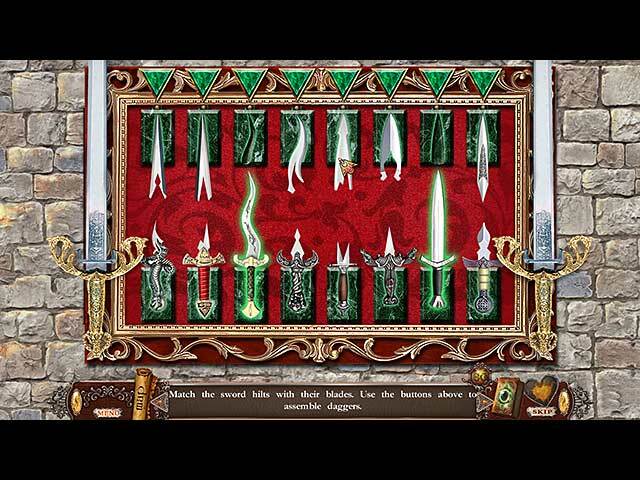 Rated 5 out of 5 by christianSandi from Great fairy tale game! Played the one hour trial on casual. Graphics are good and filled with beautiful color. I like to just enjoy the fun and beauty of the games, so I prefer casual. I will buy this and try on the harder settings though. I had no problems with download, hint refills quickly and you can speed it up by catching little fireflies that are in the scene. There are portals, different types of HOG puzzles throughout, recipes to make, evil to overcome etc. Music and voices are very good. I am very glad to see a few games recently that are not quit so dark (on the darker evil side). All ages should enjoy this game if they are looking for a fun, beautiful, happy, hopeful type of game. Rated 5 out of 5 by berrygood from This game is a must have! I knew after just a few minutes of playing the demo that this was a keeper. The graphics are gorgeous, the story grabbed me right away, the voiceovers were professional and synched nicely with the characters. The music is just right and not intrusive or annoying. There is a nice balance of adventure/quest, HOS, and puzzles. I played in casual mode, which was just the right amount of difficulty for me. More advanced players can choose from two other modes. When you use a hint, you see a picture of where you're supposed to go for the next step, and when you click on the picture, it takes you there. I loved that. There is also a map, which shows you places where you could go to take action. The HOS were varied and interactive, which made them more interesting, including some in which you find the objects and then return them to their proper place in another HOS. The story and overall 'feel' of this game is very 'Lord of the Rings.' If you like that kind of fantasy quest good against evil type of story like I do, you'll love this game! Rated 5 out of 5 by 1955raven from Lovely Game Simple to play. Really Cute cat . Great graphics, story. Love Chronicles Salvation is a Gem. I love all the advances they have made in hogs since the first love chronicles. A must have game! Rated 4 out of 5 by rosekaufmann from WHERE'S THE LOVE? A prince returns to his kingdom to find it has been ruined by an evil witch and must travel back in time to stop a young girl from becoming that witch. GOOD: Clever and somewhat involved ways to trigger HOS Heavy on 3 types of HOS: interactive; fragment and putting objects back into the scene Nicely done fun puzzles with good graphics, but they take a backseat to the HOS Unintrusive new-age music Good-looking graphics of different types from hand-drawn to 3D (or is it 2D?) Whimsical characters, particularly animals Items are in the past that did not exist at the time Interactive map NOT SO GOOD: CE has few worthwhile extras – only a bonus chapter, music tracks and artwork. Title is a misnomer – there is no romance. Storyline has been done before several times and isn’t the most cohesive. SUMMARY: go with the SE. 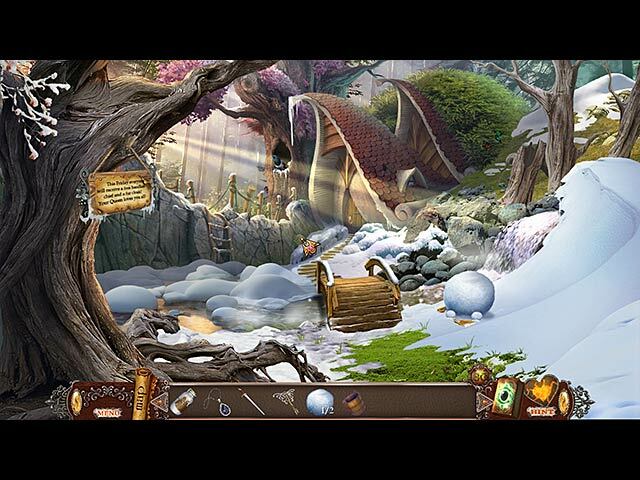 Rated 4 out of 5 by LunaNik from Thoroughly enjoyable, lovely graphics & music, relaxed gameplay TITLE Love Chronicles: Salvation Collector's Edition full game (about 5 hours) bonus adventure (a little over an hour) DEVELOPER Vendel Games produced by Big Fish Games GENRE Interactive Hidden Object Puzzle Adventure good v evil fairy tale STORY Finally, after saving two kingdoms from the dastardly doings of the evil Alura, you're on your way home. But it's not over yet! She's attacking your kingdom now! Lucio, the good wizard, sends you back in time to prevent the dark wizard Zander from turning Alura's heart to the dark side, thus preventing the attack on your kingdom. And, presumably, on the kingdoms you already saved. I know…time travel is so confusing. Bonus Adventure: You and Alura return to your kingdom, but the backlash from Zander's evil has turned Lucio to stone. Travel to the Elf Kingdom to save him. GAMEPLAY Inventory-driven adventure with iHOs, puzzles, and mini-games. The iHOs are of three types: (1) List, and a few items are interactive, (2) Sequential Silhouette, where you find items and use them in the scene, and (3) FROG Silhouette. There are a LOT of iHOs, but the graphics are so beautiful and the music so relaxing that even I, who normally detest HO-heavy games, enjoyed them. Puzzles and mini-games are mostly familiar and range from simple to difficult, a nice mix. INTERFACE ? Map - shows active areas and transports ? Journal - gathers clues and tracks storyline ? Hint - identifies object in iHOs ? Black Bar Tips - gives clues in casual mode ? Other - jewelry chest holds amulets EXTRAS ? Collectibles ? Achievements ? Morphing Objects ? Bonus Adventure ? Replay Puzzles ? 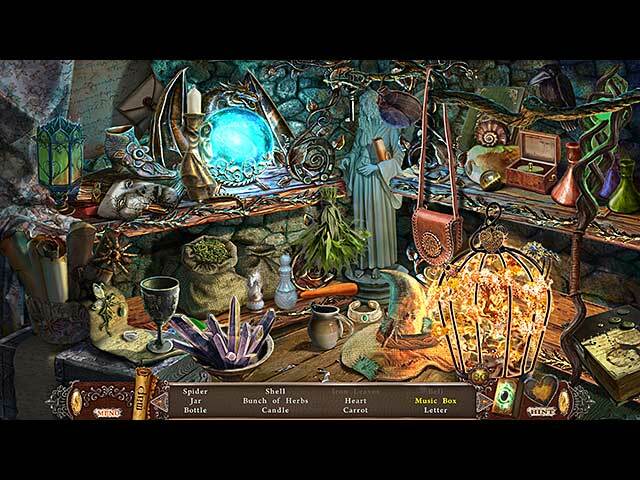 Replay Hidden Object Scenes ? Strategy Guide ? Wallpapers ? Screen Savers ? Concept Art ? Music SETTINGS ? Sound Effects Volume ? Music Volume ? Voiceover Volume ? Fullscreen ? Widescreen ? Aspect Ratio ? Custom Cursor ? Toggle Active Area Sparkles ? Toggle Navigation Sparkles 3 Difficulty Modes GRAPHICS & ANIMATION The graphics are just lovely. Beautiful use of color, light and shadow, perspective, and texture to create scenes both enchanting and terrifying. Both in-game and cutscene animations are smooth and lip-synching is quite well done. MUSIC & SOUND & VOICEOVERS The music…ah, the music. It's ethereal and ambient and everything game music should be, and it adds greatly to the player's immersion. Game sounds are appropriate, short, and non-intrusive. Ambient sounds are well done. Voiceovers are excellent. Really, the audio team deserves an award. CONCLUSION I highly recommend Salvation. It's a departure from the previous two in the Love Chronicles series, but well worth it. For those who prefer to wait for the SE, the main game does end conclusively, and the CE does not have the bells and whistles most fishies expect, like morphing objects. However, I thought it was worth it for the bonus adventure and music alone. Rated 4 out of 5 by judeejuju from A nice game A nice fairytale game. Good graphics, mixed Hos and okay puzzles. What let the game down for me was firstly that I had to uninstall and reinstall 4 times at various intervals because the game kept freezing and secondly that the bonus chapter was pretty short and filled out with as many Hos as you found in the whole of the main game (prob not..but seemed that way!). Therefore....4 stars overall. Rated 4 out of 5 by lahdeeda from Nice Ending to Trilogy Well, I wouldn't pay for the Collector's Edition, but I did like the game. Though, wowza, was that dark. Rated 4 out of 5 by pennmom36 from WE MUST SAVE ALURA! Not a bad game, beautiful fantasy graphics, soothing music and a good continuing saga story. The only problem I have with this game is holy cow how do you catch those fireflies? The HOS are interactive and they are a mixture of list finds, fragmented piece finds and find 10 feathers etc. I really enjoyed the puzzles they were just the right difficulty and some old some new, I liked the orbs you had to turn to connect them to the center piece so that all of them were lit. Some of the items you come across took a little bit to figure out such as the stove top where you put in the correct element and then you had to turn the handle but most of the items are easy to figure out what and where they go. Certainly worth a credit. Enjoy! Rated 4 out of 5 by Lazeedragon from Way too short for a collectors addition i loved this game but it should not have been a collectors edition! graphics are great sound it wonderful game play was fun basic story prince ends up back at his own kingdom (finally) he has to save his now evil infected home. bonus chapter was also very short. but had to get i 'cause i already played the 1st 2 but got it on sale :) buy 1 get 1 free. it is not really worth the 13.99 in my opinion just for the shortness of the game factor. other than that awesome game! if u wait for the se ur not missing much on the bonus chapter and i did not need to use the stratedgy guide. wonderful game tho ^^ Happy Gaming all u fishies out there! Rated 4 out of 5 by Jacoban55 from Thoughtful First a tip of the cap to a couple of reviewers who spoke my mind: "purring ginger kitty folks", "Sanford and Son junkpile" (nice analogy), and to Reviewer Nilosh, who wondered rather forlornly at the quality of today's CE's. Caused me to pause and think - yes, CE's should be more than just the "standard" stop-drop-and-roll of wallpapers, music, concept art, and (sometimes anemic) bonus play, though that was not the case in this game. Having said that, I purchased the CE (heh) and I found it quite delightful. I loved the colors - they did fine on my compy and weren't "washed out". I was especially taken with the colorful animals and attention to detail. Extremely creative and well thought out. It is clear that the developers took some time with this offering. Game play itself was fine. Very smooth, no hiccups, and the music was gorgeous. The best I've heard in quite some time. For the reviewer who wanted to hear about what others thought of the end of the game: The end of the main game was done well. I wasn't left hanging and *having* to go to the BC to find out what happened (I don't like that either). Concerning the BC, I thought the story direction itself was quite good, however, I found it to be a bit short and the end to be a little abrupt (I would have liked to have freed my friend myself). I was a little sad that they wrapped all the loose ends up and handed me the package. Less programming that way, though.... By the way, I noticed that someone forgot to translate a direction - it was still in...Russian? Forgive me, I have a hard enough time with Englsh! :oD It had to do with getting into a door I believe and when you click on it to see what you needed to open it, the explaining text appeared in ...err...that other language. That only happened once, and I figured out I needed some sort of amulet or something to get the door to open. ;o) Overall, this game was very good and I am glad that I purchased it. This set of reviews, though, is quite thought provoking and I hope that all developers take note. Rated 4 out of 5 by RevRose from Very attractive, entertaining and ungrim Despite the series title (which is off-putting), this latest entry is really very good. Lots to explore and do with a goodly number of HOS. The mini-games vary wildly between perfectly straightforward to "hmm, not sure what to do here". Graphics charmed me and the storyline is engaging, rather than intrusively sentimental. The plot is satisfying and has an appealing twist at the end. I have played and enjoyed the other two episodes, but this stands alone quite happily. Transporter map is helpful, although it does occasionally insist there is something to do when there isn't. I'm not sorry to have purchased the CE, but in honesty, although I enjoyed the bonus chapter, it doesn't really fill the bill as far as bells and whistles go. Not a huge amount of replay value, unless you enjoyed the story enough - which I did, but that may not be enough for some of you. My quibble is that there are some odd mis-labels in the HOS scenes (please note, a Sunflower and a Snowdrop are not that much alike). Also "figure" is unhelpful in the extreme, particularly in a scene containing many, many items that could be regarded as a figure. Resorting to hint and finding they meant a chess piece was irritating. That aside, this is a thoroughly enjoyable game. I recommend, but would suggest waiting for the SE unless you regard a bonus chapter as enough reward. Do note that the bonus chapter is not needed to end the story conclusively and well. Rated 4 out of 5 by biscuitsmama from At Long Last The Prince Returns After years of fighting the evil witch Alura, you return home to find that she has also devastated your lands as well. Now you must find a way to put an end to her evil for all time. There are 3 modes of gameplay – casual, advanced and hard. The game opened automatically in widescreen on my Windows8 laptop. The graphics are good as are the voiceovers and musical score for the game. I love games with colorful graphics that add to my enjoyment of a game, and this game certainly has plenty of color although it is not over the top, which is good. Even though some scenes appear misty, overall the graphics are still very nice. You have a diary located on the bottom right and an icon for the interactive map on the left but you can also access the map in the diary. I think the developer has included every type of HOS possible so they are varied. We also have mini puzzle that are not too difficult but some seem frustrating because they are spin this and then something else moves. Quite frankly, those are not my favorite type of mini puzzle so fortunately they are not all like that. As far as CE content goes we have a bonus game and a strategy guide along with a bunch of useless extras, so many of you might want to wait for the SE. IMHO, having a strategy guide is nice but not something I use unless I am extremely stuck. There are no achievements or morphing objects. I purchased the CE only because there was a sale this weekend. It is a nice game but IMHO, not really worthy of being a CE. If you don’t want or expect too much in a CE game, it is still a very nice game. Rated 4 out of 5 by ticaheart from Review of completed Game CE Enjoyed the game! Like the fact it was fairy tale and not vampires, wolves or monsters lol. The game did keep me wanting to go on and see what happens next. Art was nice, liked the story line, music was nice.. Map was ok, wish it was interactive. No journal. Did not give a good explanation of some of the items you collected that made the hint button fill faster. You do not need the bonus chapter to finish the story line. Bonus features are ok, Bonus chapter has different story, but same concept as main game. I bought this on buy one get one that is why I bought the CE. IF the promo was not available I would recommend waiting for the SE. Rated 4 out of 5 by dancemom1 from Not exceptional, but nice... Got the first two LC games and really liked them. This one is pretty much the same as far as graphics and game play (nice). Games are simple. A lot of cut scenes, but you can click through them. You spend a lot of time and good shoe leather running back and forth quite a lot. I liked the mixture of HOGs (silhouettes...too many, list of objects and "put item back"), but the color was a bit washed out and some items difficult to see. Gets frustrating when you find an object but can't pick it up until you find something else first. I like a challenge, but not when it becomes frustrating and "not so much fun anymore." Music not bad. Hint system nice, fills fairly quickly, but I did not care for the catching of the fireflies. They aren't that difficult to catch, just seemed like an useless step since the hint fills anyway. The fireflies just make it fill faster. Map wasn't bad, at least it was a jump..good thing since you ran around in circles quite a lot. This was a somewhat challenging game, nothing extra or special. It did not make me want to run out and get it as soon as the demo ended. I would hope that this is the end of this series. As I have said numerous times, I am trying not to buy CE games, unless there is a real hot special. That said, since it is buy one get one free, I will get this game to add to my collection, along with the Dark Parables CE I passed on earlier this week. As always, try it for yourself and see what you think. We all have different tastes in games and you may not care for this one at all. Thanks for the reviews. Rated 4 out of 5 by rugspot from Enjoyable!!! I did the trail period. So, really wasn't sure if, it would be a purchase for me. There are curtain things I look for in a game. I am always looking, for awesome. Sometime I purchase then, I am sorry because of the trail. So, this is that kind of game. Rated 4 out of 5 by swampie from BASED ON THE DEMO A pretty game with beautiful artwork and lovely fantasy locations. An organic look where globes are lit with fireflies, flowers grow on the walls of Hobbit-like dwellings. Villians are not too scary and the theme is not too adult.The HOs are mostly interactive and the puzzles are standard. The map takes player to location witha click. Only negative is that the back button is so close to the inventory box (as in many other games). I will purchase this game, but based on previous player review, will probably wait for the SE. Rated 4 out of 5 by lovesangelrn from Pretty fun game, not sure if it's worth CE price REVIEW BASED ON ONE HOUR DEMO I have not played the others in this series, but had no trouble following the plot. It was obvious I was missing some back story, but didn't feel too left out. You are a prince, on a mission to save the witch that has plagued you for so long from becoming evil in the first place. --3 difficulty modes, which can be changed at any time through the menu. --5 chapters + bonus chapter. During my hour demo, I made it through most of chapter one. --Map...Jumpable and with some indication of where you should be to preform a given task. I see another reviewer mentioned that the map indicators are not always right, and I could see that happening given what kind of info it gives. --Voice overs (but something about them just weren't convincing to me...sounded like the same actor for all the male voices). --soundtrack was pretty and relaxing. --Hint/skip button fills quickly on casual mode. Hint works well outside of HOS. Lots of black bar hints on casual, almost too much hand holding...wish I had tried advanced instead. --HOS...there were quite a few in my demo, but they were varied in type and were all interactive. I had 2-3 lists with junk piles, a couple of FROGs, 2 "put the items back", and one "find x number of items" The scenes were all pretty clear, but some of the items did not look like what I thought I was looking for (the "screwdriver" was not a traditional looking one) --Puzzles....on the easier side, but still fun. --SG, stayed open to the last page you were on....honestly, I never used it during the demo. --no collectibles, no achievements (well, you are collecting gems to install into amulets to break the curse...but as that is intergral to the game, I don't consider it a collectible or extra) CE extras: SG, wallpapers, conceptual art, and soundtrack OVERVIEW: My hour really flew by, and I was caught off guard when the game stopped because time had run out....so I was enjoying the story. If it this had all the normal CE extras like collectibles and achievements, I would be really tempted (takes alot for me to spend the extra for a CE). But story and decent looking length will keep this game in my sites for a SE as long as the ending is wrapped up without the bonus chapter. (I will NOT buy a CE just for bonus content to finish a story line, I hate that, and will not support devs that do it...a CE should have extras, imo...so I will be interested in other's reviewers perspectives of the ending). Rated 4 out of 5 by MaggieMaze from Silly Name! Fun Game! Usually I would never touch a game called “Love Chronicles” but, being in mood for fairy tale fare and a relaxing quest, it worked for me. I checked out the demos of the previous two games in the series and liked them too, for the same reason. A definite upgrade for the series, with voice overs this time, improved animation and cutscenes, character interaction and a more immersive storyline. Time travel changes it up a bit as you search for the four amulets necessary to protect Alura from the evil clutches of Zander. Guess we now find out how the "wicked witch" got that way! Stunning graphics with lots of colour and beautiful artwork. Very light gameplay, varied HOS, familiar puzzles, hint, journal, transporter map, task markers. In other words, the usual. The music relaxes to the point of sleepiness. Without collectibles and achievements, it really doesn’t offer much as a CE. There is nothing spectacular about this game but it is strangely appealing. If you need to zone out, de-stress or just have some fun with the kids, consider giving it a try! There’s a great sale this weekend! Rated 4 out of 5 by belamba from Really enjoyed playing this game! Very good game. Played 'hard' mode and it took about 4 hours to finish. The graphics were super, and the music in keeping with the mood of the game. Wish more game devs offered a sparklle free mode, that does allow you to skip puzzles and get hints. Skip and hint took longer to refill, but not laboriously so. A nice variety of HOS, and puzzles. Nothing new in the puzzle dept., but well put together and excellent graphics. Hint system was excellent; I liked the way the hint took you to the place where there were things to do. The map was good, but at times the objective was incorrect. Never needed the SG. A little too much hand holding...we have brains enough to know a screw requires a screwdriver! The bonus content wasn't value for money, too short and too many bog standard HOGs. All in all enjoyed this CE! Rated 4 out of 5 by swissraven from Enchanting fairytale type game This game will please all those liking fairytale stories as it has all the right ingredients in it. 3 game modes, lovely fairytalish graphics, good voice overs, fight of good against evil. The mini games are fun and not too hard to figure out with the skip button activating pretty quickly, the HOS a little different than the usual type. Good map and diary. The fun bit for me was trying to catch the fireflies in order to recharge the hint button. Rated 4 out of 5 by mrm2006 from What a great game! First of all, the graphics and voiceovers were amazing. The colors were incredibly bright and combined with the effects going on around you at the same time made the overall experience great. The hint button regenerated in a rather different way than we are all used to and that can prove difficult. The storyline was so incredible! This is a game, however, I would only recommend for the more experienced intermediate and expert players. But give the Free Trial a whirl, that's why it's there. I can't say more because it was so difficult that I really didn't get as far as I'd like. But it's truly a great ending to the series. Rated 4 out of 5 by JustTheFacts from 5 Stars To The Standard Edition BASED ON DEMO This game is not CE standard, but it is an EXCEPTIONALLY DELIGHTFUL game. As a SE, this game promises to be VERY ENJOYABLE. The GRAPHICS are BEAUTIFULLY & IMAGINATIVELY drawn. This is a MAGICAL TALE, so you will see some very different pictures of everyday items. The MUSIC is pleasant and ethereal, but the AMBIENT SOUND is really good. I searched everywhere tracking down that mouse I could hear, and as it turned out, it was important that I did. The GAMEPLAY is HO with a FEW (SO FAR EASY) PUZZLES, and a goodly EMPHASIS on NOT DIFFICULT adventure. There is a JOURNAL, an INTERACTIVE JUMP MAP, and a HINT that JUMPS you to the suggested area. The HO SCENES are a major plus. They come in MANY TYPES. So far, INTERACTIVE LIST, SILHOUETTES, MISPLACED ITEMS, & make-something-with-stuff-from-this-area. There are also HOS that cannot be unlocked until you find MULTIPLES OF, and FRAGMENTED OBJECT HOS. The variety of HO types alone makes the game just that much more interesting. But the BEST thing about this game is the STORY. Having come home from your previous adventures, you discover your earlier foe is taking revenge on your kingdom. In order to stop her, you must TRAVEL BACK TO THE PAST, at a crucial moment in her life, and PREVENT her subversion to EVIL. I know it's been DONE BEFORE, but it is FUN. Her mother’s MAGICAL AMULETS (4) will prevent this catastrophe, if you can get them in time. And so, your quest. Along the way, I suspect a little romance. The SG shows 5 CHAPTERS and the BONUS CHAPTER, along with an introduction, which I did not complete within the hour. So I’m thinking the game is a DECENT LENGTH. I am really enjoying this game, but I would NOT recommend the CE version to the average gamer. We simply expect more than ART GALLERY, MUSIC and BONUS CHAPTER these days. With this weekend’s sale, perhaps a lot of people will decide to live without the extras, (and I might even be one of them), so to them I say... ENJOY! Rated 4 out of 5 by neilskinut from The 3rd in the series good, fun, just not great None of the chronicles have done all the great. Fun games just lack the great quality. Has voice over, good music. The graphics are good just not crisp. Has a map that will take you to where you need to go. Hint button works good and fairly fast. 3 modes of play. The HOS are different in you have to find items to put together your item to use. They are not hard. The puzzles are quite easy also. some may give you a challenge but most are easy. Lots of clicking to do in this one just to find things. There is not a real good flow to this game to me. Lots of running back and forth. All in all not a bad game just the love chronicles have never been a great game. They need to play some ERS games to find out how to improve these games. There is an adventure here just lacking the wow factor. Rated 3 out of 5 by aqcheryl from The bonus chapter was better than the game Having played the other Love Chronicles games, I anticipated this new one. Unfortunately I finished it disappointed. Over half of the game ended up being in this weird area with demonic style artwork. Which is fine, if I was playing a horror game... but not this. I do like that the storyline allows us to save the witch before she ever became one.. but I just didnt care for the 'world' or atmosphere of the game. Also, when you first start playing, you are met with very few HOS.. which I appreciate - there were several other different types of puzzles. However also halfway through the game, the HOS really picked up. I felt like they got bored with the project and to finish it off just shoved in more HOS. To be honest, Im really starting to hate HOScenes. They are boring. So to be hit with one almost every screen, or sometimes even two... and nothing much else... left me with a sour taste in my mouth. The bonus game was much better in regards to graphics. It takes places in what looks like a elvish village that was iced over, and you have to find out why. I do wish the bonus game was a little longer and the story a little more thought out, but at the very least, I think the bonus game was the full length games "salvation"
Rated 3 out of 5 by Polrev from Polished SE, but poor CE I wholeheartedly support those reviewers, who suggest putting off the purchase till SE. I do not think this installment is worth the CE price. Well, I am not being down on the game. I am suggesting that lately CEs give up quality and challenge to quantity, thus losing a bit on the users. Anyway the game itself is very much enjoyable. I am a huge HOS lover, and Love Chronicles boasts a variety of them: silhouette, interactive and reverse type. Mini-games were less challenging, anyway inventive and fun to play. The hint system works perfect and fast, useful outside HOS. The music and voice overs were professionally done, supported the general impression of the game, and were not intrusive or repetitive. I adored the graphics of the game: amazing artwork and very clear colors. Unfortunately there are no achievements and no collectibles within the game (my favorite feature in CEs). The level of challenge did not leave up to my expectations, even in the hardest mode. To sum up, I will recommend the game to the fans of the series or those who don’t care about the great challenge. Rated 3 out of 5 by avndh from Not my favorite game Well, I thought I would like this one, and I do like the artwork, and colorful backgrounds to. But the game falls short by a lot! First - I HATE the strategy guide! I only needed it a few times, thank goodness, because it was just awful to get to - menu-extras-strategy guide - chapters etc. Come on, put the darn thing on the main page! The story wasn't very interesting either - it was a sort of mixed up fairly tale that really didn't work. And, it was a disappointment as a CE - really nothing to grab you with - no achievements, and really irritating music - I kept trying to turn it down, and it would still be VERY loud! I'm sure some will like this,but I wished I just passed it by or waited for the SE. That is really what your getting here in mho anyway.